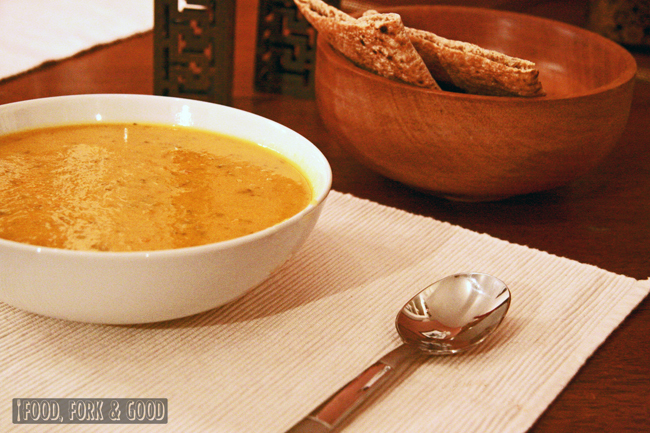 Spicy Mango Squash Soup - Fork and Good. But it does not contain actual orange. Though it did nearly have pumpkin in it. But the pumpkin selection at le market was poor. Plus, we aren't trying to promote a phone network here, just some damn tasty soup! My apologies for the absence. I have been very poor and living out of my pantry & freezer (fun to start with, gets boring very quickly), and I'm happy to say that payday has since arrived and I have been feasting like a king since then. ...but 3 weeks of rice, wholemeal spaghetti, canned pulses and packs of Quinoa/pearl barley and frozen leftovers have left me feeling exasperated with dinner times. Like literally just grateful for something different. I've been dying for a big old slab of cheese, or some meats, veggies that aren't in the reduced section, just anything that didn't come from a jar in my little pantry. So what delights have I made since glorious payday arrived? Well, mostly soup. Hardly banquet-esque, but I've not been feeling well. So soups it has been! I love a good chicken soup when I've got the sniffles as much as the next person, but if I'm a big fan of making soups that make people go "What?! WHAT?! What did you just put in there?!" "You don't put fruit in soup!" I hear you scream. To that I reply, technically tomato is a fruit. And correct me if wrong, but that's a very popular soupy ingredient. But I do understand. Sweet soup? Like custard? Trust me. Once you've sweetened your soup with the flavours of your fruit stand, you'll never go back to dirty sweetener or sugar filled cans. Or maybe you will, who knows?! But we like to experiment, non? Ooh look at how shiny my spoon is! So reflective. Do you ever look at the cutlery in food photos? I can't resist trying to work out if I can see something funny in the reflections. Though, I don't know what I'm expecting to find really. A bit like the time I tuned into the naked chef and was greeted by a big smiley Jamie Oliver instead of an actual naked chef making hilarious innuendos about sausages and melons. I discovered I was a pervert that day my blogging friends. So I'd been staring at one once for like 5 minutes, when I got really freaked out by how similar the reflection in the spoon looked like my dining room, everything was pretty much the same, as much as you can tell from a spoon anyway. That was ten minutes ago, and I was actually looking at my own picture above. Completely lost in my spoon searching to notice it was my own picture. Time for recipe I believe! Easy peasy and one of the best reasons I love soup. Low fat, healthy on the old ticker and not a spoonful of added sugar in sight. Any questions, once again, all you have to do is ask. Mango and squash...I love the combo. The soup must be very tasty. I can imagine your feeling living out of your pantry and freezer. I tried to do it once and it was so hard...specially when you like cooking and enjoy food. Your soup looks nice, can't wait to try it!! Hi Emma! That's a nice soup recipe. Thanks for sharing. I'm the stick like gray thing next to the flash dude! I've never had squash and mango together before - it sounds really yummy! An interesting and creative soup. This soup is full of wonderful ingredients Sounds so yummy!! Lovely idea and the colour is fantastic! 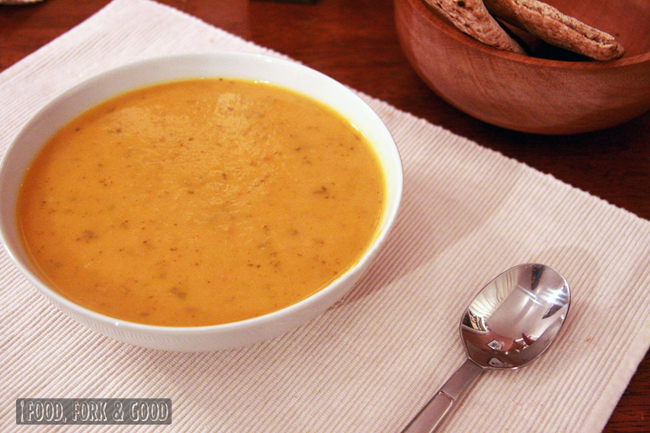 mmm that is one awesome orange looking soup. I love soup, nothing taste better in the winter time than a good bowl of soup. I never would have put these ingredients together but they sound like they work wonderfully together. I would never have tried mango in a soup like this one...until now! 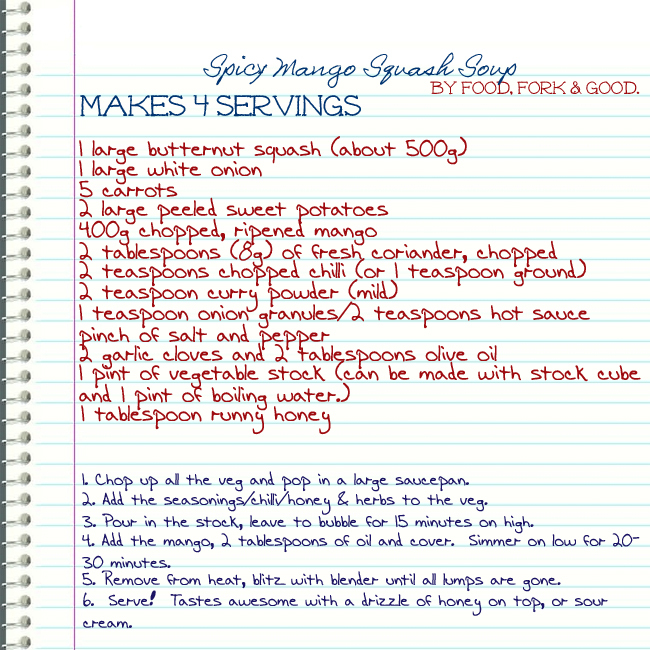 The mango and sweet potatoe combination sounds stellar. This soup would brighten up anyone's day! I wish I could have some for lunch right now. Hey cutie come stop by and add your page to our link up party today so other bloggers can meet ya!! Is it either/or with the onion granules/hot sauce or both? Only they don't sound like they are straight alternative. Sounds lovely, either way.